Vernon Ah Kee Wegrewhere #2 digital prints on Fujiflex UTS ART Collection on loan from the Corrigan Collection. Image courtesy the artist and Milani Gallery, Brisbane. wegrewhere #2 is one work in a larger series of photographs and installation titled Cant Chant, shown at the 2009 Venice Biennale and toured nationally. The installation involved large text works, surfboards printed with Yidinji shield designs and portraits of the artist’s family, photography and three video works. The work was created after the 2005 Cronulla riots. On December 11 thousands of people converged on the beach at Cronulla as racial tensions and disputes between beach going Middle Eastern Australians and white Australians flared. White Australian rioters chanted “we grew here, you flew here” as a means of claiming a greater entitlement to the beach and its surrounds. Ah Kee has used this chant as the title of the images to reference the ideology of white Australian beach culture and as a reference to his own heritage. The image wegrewhere #2 is of Ah Kee’s family members wearing surf gear on a beach. The men are dressed in clichéd surf gear – bright colours, brand names, sunglasses and thongs – seemingly dressed for the part of beach goer, but there is something jarring about their choice of attire, like they are dressing the part rather than being a part of the culture. 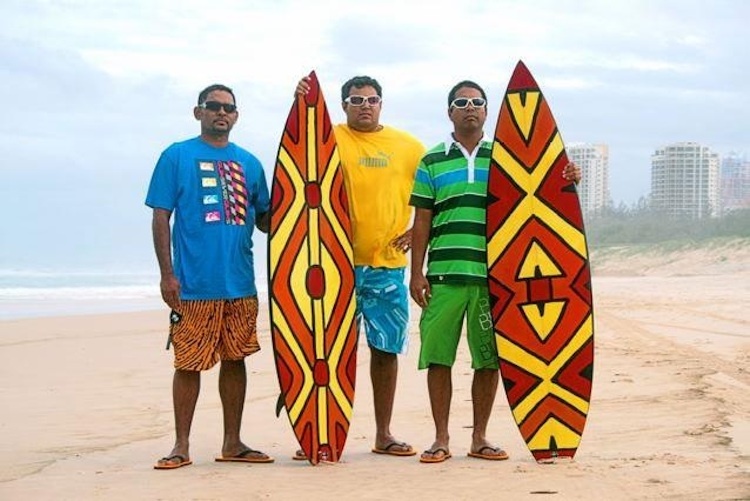 They stand with their Yidinji shield surfboards planted firmly in the sand of a beach surrounded by high rise towers. The arrangement of signifiers Ah Kee has gathered together in this image leave the viewer wondering where exactly these men belong, in turn making us question, if these men don’t belong in this country, who does? It was published in February 2015.